Whether you just got engaged and want to treat yourself or are looking for a gift for a newly engaged friend, these 15 engagement gift ideas are sure to make you smile faster than you can click add to cart! 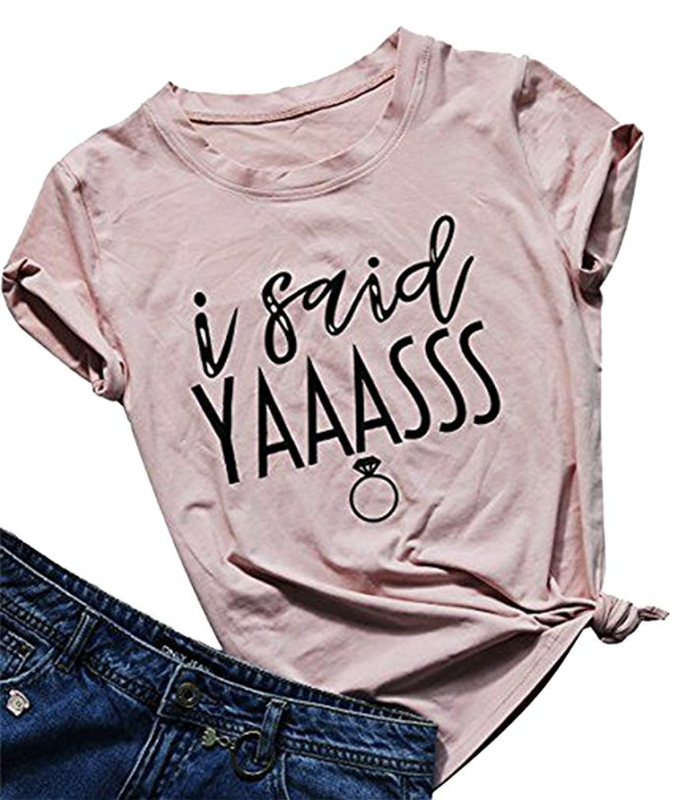 Said yaaass and want to tell the world? What better than this adorable I said yaaasss t-shirt? Complete with an engagement ring emoji, this blush pink tee is perfect for dress shopping, your bachelorette party, or even as an option for your engagement photos. Count down the days to the big day with this wooden wedding countdown calendar. Adjust the blocks daily to count down towards your wedding and after you tie the knot, flip it to the other side and use it as an anniversary tracker to count upwards from “years since we said I do”. Maybe it’s the ring, maybe it’s the excited glow, but this Does This Ring Make Me Look Engaged? coffee mug is a not-so-subtle way to tell the world you’re about to tie the knot. Spill the tea with your coworkers on how your partner popped the question while sipping your tea from this generously sized 11 ounce mug. Stash your sparkler safely with this cute engagement ring dish. This ceramic trinket tray will keep your engagement ring soap free while showering and prevent it from getting damaged while washing dishes. Your guy may not have a shiny new ring to show off his status, so get him this Leveling Up to Husband t-shirt as a fun way for him tell all his friends that he’s about to tie the knot! Apps and online notes are great, but sometimes you just want to write stuff down and keep it in one place. Enter the wedding planner. This spiral bound hardcover paper planner has spots for guest and vendor planning as well as monthly planning and areas to jot down your vision for your big day. The groom-to-be’s role doesn’t end with popping the question. With answers to common questions and male-oriented advice, the Groom’s Instruction Manual is the perfect wedding planning companion for your guy. Engagements and weddings mean lots of toasts in your honor, so say cheers with these hand blown crystal champagne glasses. Raise a glass with them at your wedding and save them for sipping champagne on your anniversary for years to come. After fiancee comes wifey! And this slouchy wifey sweatshirt is perfect paired with leggings and makes a comfy outfit to wear on your flight to your honeymoon. And who knows, maybe you’ll score a free upgrade by sharing your new status with the world! Weddings and wine go together like you and your partner! So sip chardonYAY from the straw of this wedding planning cup while you check things off your to do list as the big day approaches. Keep your bling extra sparkly with this on-the-go ring cleaner. Just dip and twist and bring your ring back to its original extra shiny state! Give your newly engaged pals a fun way to document their wedding planning process with this Instax Camera (bonus if it’s their wedding color). Flipping through a phone book sized wedding magazine is something of a wedding planning rite of passage. A six month print or digital subscription to a bridal magazine is the perfect way to get your wedding fix while taking away useful planning tips. Celebrate your engagement with this personalized engagement ornament. Featuring two sweet little lovebirds this wooden milestone ornament can be personalized to include your names and the date of your engagement. Give your passports some panache with these matching Mr. and Mrs. passport holders. The blue leatherette passport covers fit standard size passports and are a perfect way to kick off your honeymoon in newlywed style.